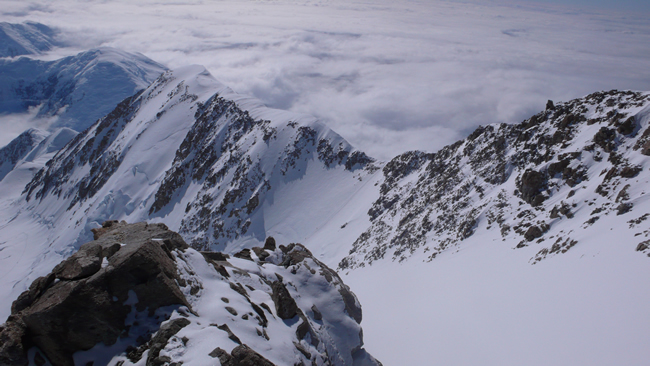 High Camp at 17,200 feet on Denali is a cold and harsh place. Winds in excess of 70mph are quite common, and temperatures are often -30F and colder. Camps must be well-protected, and block walls must be carefully constructed to protect tents during storms. 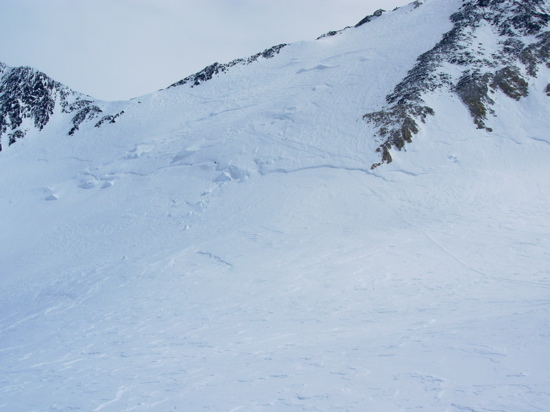 It is not uncommon for even double block walls to be eroded by the high winds, and High Camp has been the scene of more than one stormbound epic. 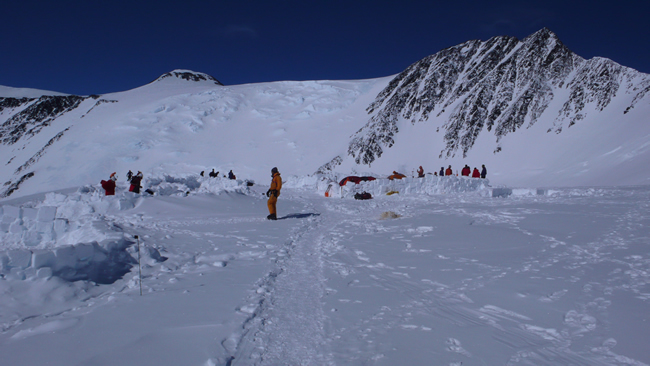 Because of the high altitude and harsh conditions, we try to minimize time spent at High Camp. 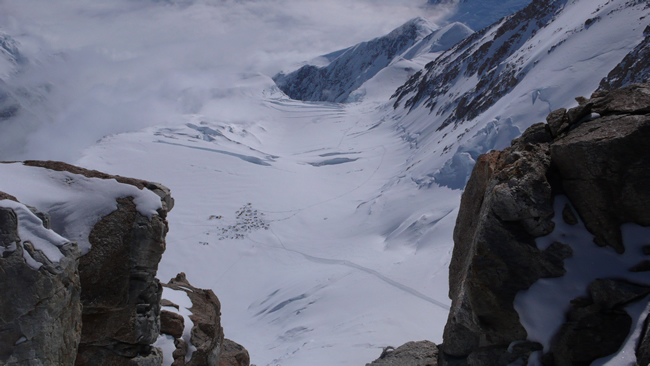 More than one AAI team has endured foul weather and conditions for as long as a week before getting a break for a summit attempt. 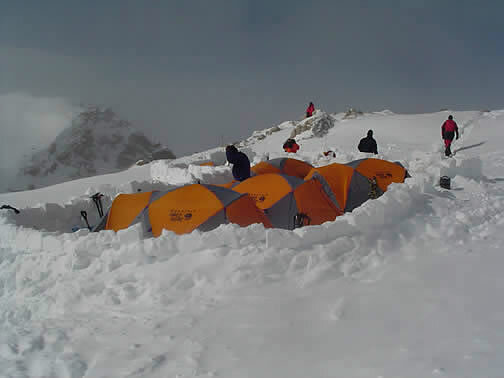 Most groups spend 3-4 days at High Camp. 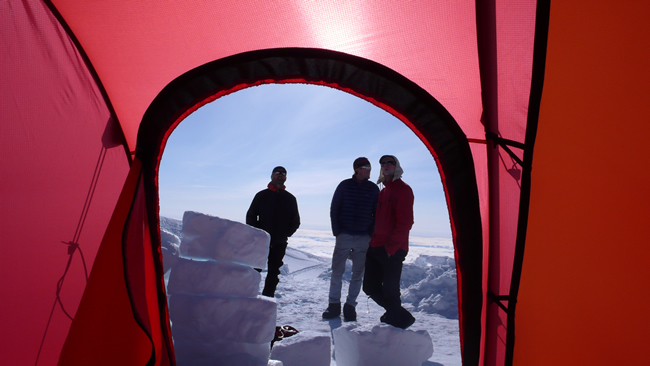 At High Camp, we cook in our vestibules and only eat dehydrated and dry foods. 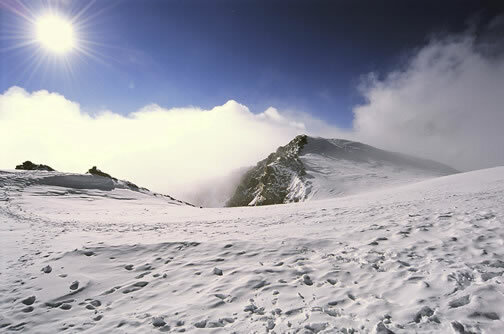 The high altitude and cold temperatures make it hard to do anything other than boil water for hot drinks and dehydrated meals. 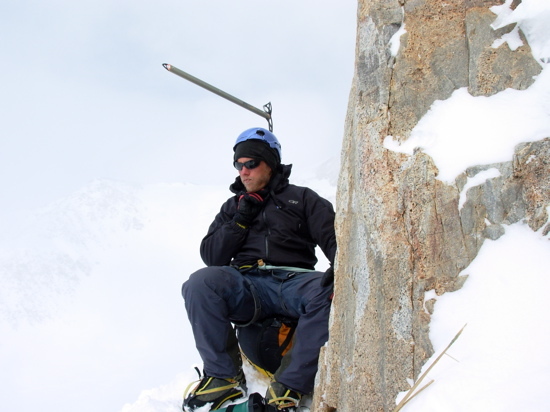 The cuisine is less than fine dining to say the least, but most climbers are more concerned with generally staying comfortable and warm than with eating tasty food. Even simple tasks such as going to the bathroom or digging through one's backpack seem difficult at High Camp. 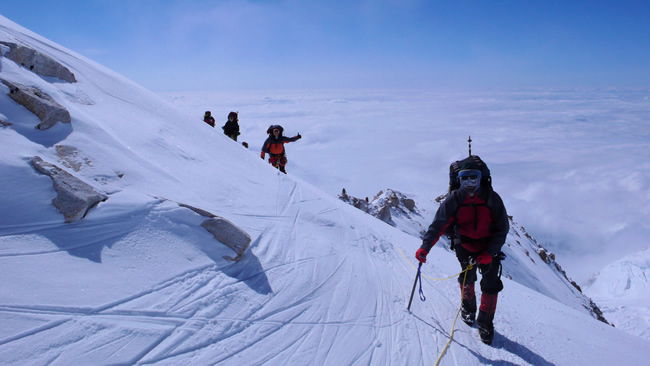 An AAI team rounds the corner to High Camp with the ridge in the background. 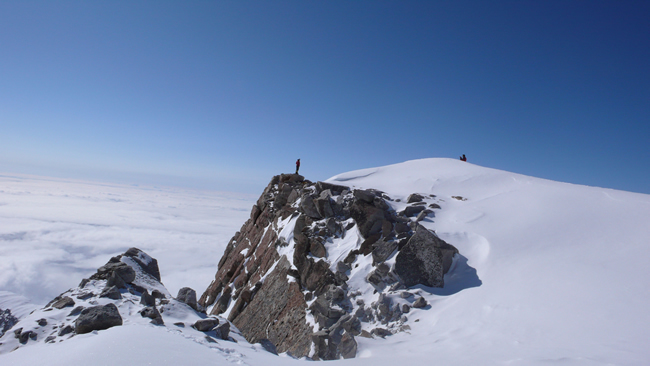 High Camp at 17,200 feet. 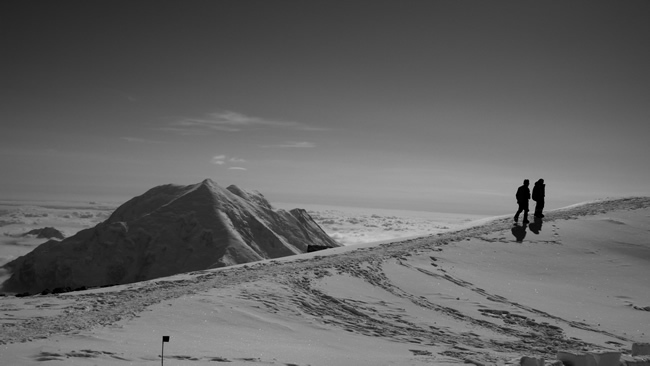 Looking from High Camp up "The Autobahn" and to Denali pass at 18,200 feet. AAI guide Erik Johnson works on the group dinner at High Camp. 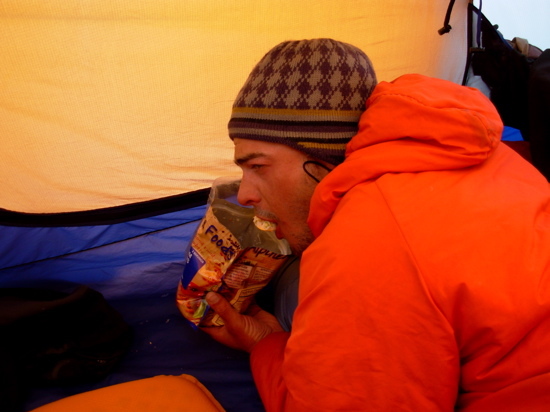 Guide Matt Anderson digs into another tasty dehydrated meal at High Camp. 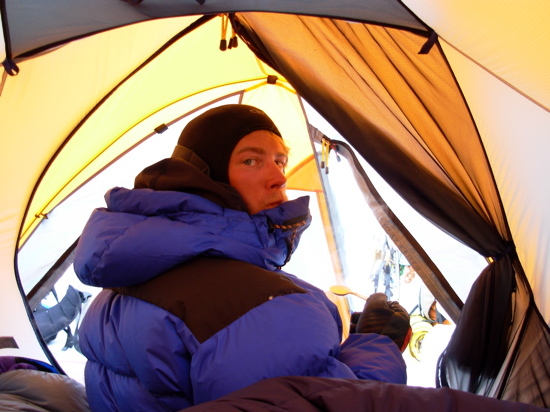 Guide Erik Johnson contemplates the cause of his altitude headeache outside of High Camp. Climbers walk along the edge of the plateau near High Camp with Mount Foraker behind. A unique photo opportunity on the edge of the plateau near High Camp. Looking down on the fixed lines and the ridge from High Camp. Looking down on the Camp 3 from High Camp. 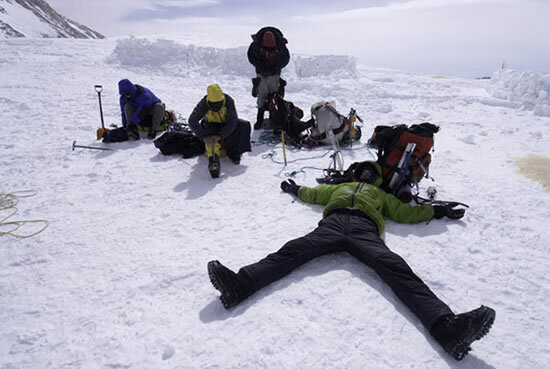 AAI guides talk strategy on a rest day before their summit attempt.